The Mortlake Soldiers' Memorial Hall was originally the town's Mechanic's Institute but was renamed in 1923 as the Soldiers Memorial Hall in memory of those who served in World War One. Additions were made to the hall in the 1960s and included a foyer, toilets and kitchen. 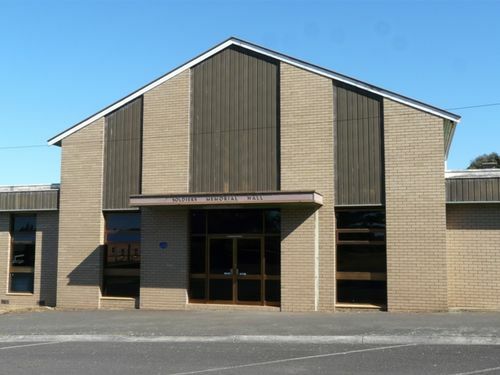 The attendance at a public meeting to consider the advisability of erecting a new public hall in Mortlake was particularly good, showing the desire of the people of the town towards an improved hall. Dr. J. C. Baird presided. The Secretary presented the financial statement showing that the improvement fund had a credit of £1093. The Chairman outlined the origin of the movement, which was to the effect that an appeal be made for £1800 to enlarge and remodel the present building; that a room be provided for use of returned soldiers and when not required by them to be used by the Mechanics', and that the hall be styled the Soldiers' Memorial Hall. Since then a new proposal had been submitted to build a new hall on a different site. Dr. Scott led the discussion for a new hall and pointed out the advantages possessed over a remodelled building, which at best, he claimed, would be only a patchwork. The Chairman pointed out, that they could not go beyond the decision arrived at to renovate the hall, as the money was raised for a specific purpose. This phase of the question was the centre of considerable and most amusing discussion. Ultimately Mr Graham moved, and Mr H. B. Davies seconded, that in the opinion of the meeting a new hall should be erected on a new site and that a committee be formed for the purpose of ascertaining costs and that plans and specifications be drawn up to be submitted to a public meeting. Rev. McBride moved an amendment that the original proposal of the public be carried out and that the present hall be enlarged according to the opinion expressed. Mr W. H. Flanders seconded the amendment. On a vote being taken, the motion was carried. Mr McKinnon moved, and Mr Graham seconded, that the following committee be appointed to carry out the requests of the resolution, viz., Messrs Graham; Scott; Dougall, Squires, McKinnon, and Anson. Camperdown Chronicle (Vic), 9 August 1923.